PLASA Focus will see the UK launch of the LEDHead Mini-Map miniature LED screen. 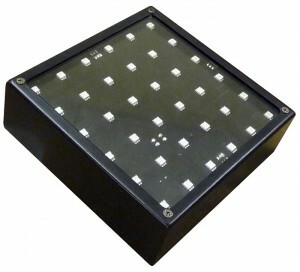 The Mini-Map will be the first of the LEDHead range to be manufactured in the UK. The LEDHead range has been expanded to include two pixelmap products for stage, corporate and entertainment lighting use, the Mini-Map miniature LED screen and the 3D-Pixeltube. The Mini-Map measures 150mm x 150mm with 36x 5050 tricolour pixels. It can be used individually or in clusters to produce video and graphic effects. The Mini-Map has a steel casing, PowerCon and XLR5 connectors and is designed for touring and installation use. The PixelTube is a 3-dimensional lighting system designed to give spectacular lighting effects when the LED tubes are hung above a stage or from the ceiling in entertainment venues. Both products use DMX512 control to allow compatibility with the many DMX512 pixelmapping systems now available. The LEDHead Batten2, which has been a big success in the UK with rental companies and TV studios, will be shown with the new “Cycwash” option which allows it to be used as a cyclorama wash. This option enables the Batten2 to give an even wash of light up to 6m high while positioned only 1m away from the lit surface. In normal batten mode it can be operated as a single source or as an 18x quadcolour pixelmap unit. Three new LED moving heads will also be on display. The EPW2 and EPW3 are both 3-function lighting units with true spot and wash features and the ability to pixelmap the wash LEDs. They are powered by 180W and 200W white LEDs for the spot function and 9W tricolour LEDs for the wash. The EPW3 has a zoom lens on the spot function. All of these products can be seen alongside a new 60W LED scan, LED tapes and a selection of powered and wireless uplighters on the MilTec (UK) Ltd stand, New Dock Hall stand N-C7.